It is stated that as per ICT (Zoning) Regulation, 1992, amended from time to time, Islamabad Capital Territory (ICT) has been divided into Five Zones. Three Zones out of Five Zones, i.e. Zone-2, Zone-4 and Zone-5 have been earmarked for Planning and Development of Housing Schemes/Agro Farming Schemes by the Private Sector i.e. Co-operative Housing Societies or Private Limited Companies. Such Private Schemes are also allowed in Sector E-11, Islamabad. CDA has been regulating Planning and Development of Private Housing Schemes in said Zones under ICT (Zoning) Regulation, 1992 and the Modalities and Procedures framed there under. 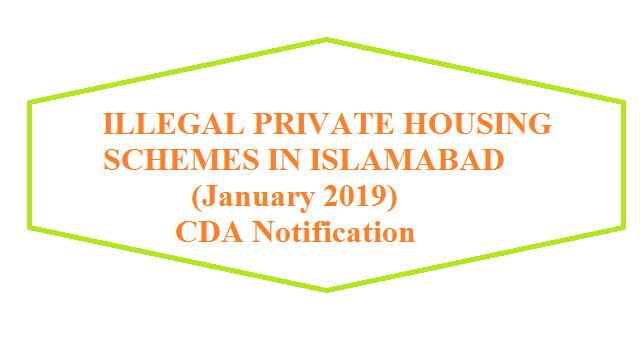 Two Steps approval of Private Schemes are granted by CDA. In the First Step Layout Plan (LOP) is approved then on completion of subsequent requisite formalities, the No Objection Certificates (NOC) is issued. CDA also issues Completion Certificate after completion of development in the Scheme as per the Approved Layout Plan, Design of Services and Approved Specifications. The Directorates of Housing Societies & Regional Planning of Planning Wing, CDA are dealing with the affairs of the Private Housing Schemes in Zone-2, Zone-4 and Zone-5 of ICT. Further, since August, 2016 Directorate of Building Control -2, CDA has been established for exercising Building Control in Private Housing Schemes and other Private Lands.